Avg. Group Discount of 16.9%! Homewood Suites by Hilton Richmond - Downtown is located in the heart of downtown Richmond steps from the Virginia State Capitol Federal Courthouse Richmond Coliseum Richmond Convention Center and a multitude of restaurants entertainment and shopping options. Come experience our oversized guestrooms and suites which are 80 larger than traditional hotels. we give you the space you need to work live and play.Start your day right with a complimentary hot full breakfast and enjoy a complimentary evening social* Monday through Thursday. Our expansive suites feature separate living working and sleeping areas. Feel at home with amenities like complimentary WiFi a pull-out sleeper sofa and a full kitchen. Buy drinks snacks chilled meals and toiletries in the 24-hour convenience mart or take advantage of our complimentary grocery service. Located on the first floor of the hotel Belle and James Restaurant offers upscale American cuisine with a focus on seasonal locally-sourced ingredients.Our all-suite hotel in downtown Richmond boasts a fantastic rooftop lounge and restaurant offering stunning views of the James River and both indoor and outdoor seating. Energize in the contemporary fitness center or refresh in the heated rooftop swimming pool. Organize a seminar conference training session or wedding with 7000 sq. ft. meeting space including a 3000 sq. ft. ballroom with ample pre-function space. *Subject to state and local laws. Must be of legal drinking age. Local Shuttle Info: Hotel Shuttle seats 9 guests. Will shuttle to venues within 2 miles of Hotel. Shuttle on first-come basis. 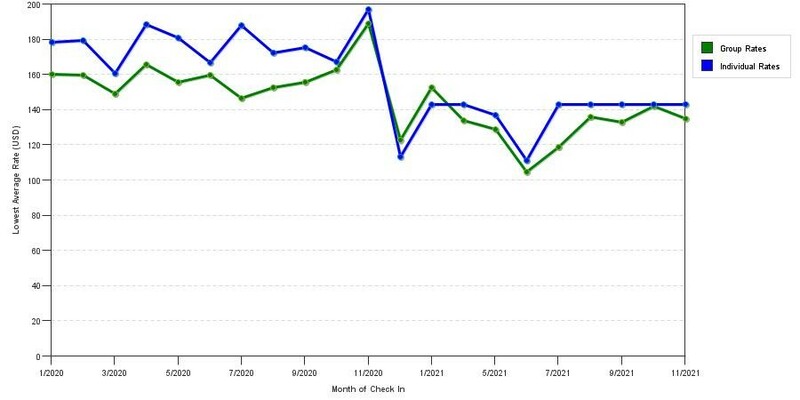 The graph above is averages of room rates for both group quotes and the lowest online individual rates our system could find at the time the group/meeting bid was entered. The lowest group deal shown is 24.9% in February 2018 and the highest average individual rate is $211 in the month of February 2018. This chart will show past seasonality and also project future months. If you are flexible with dates, you may want to consider staying at Hampton Inn & Suites Richmond Downtown in a month when rates are lower. 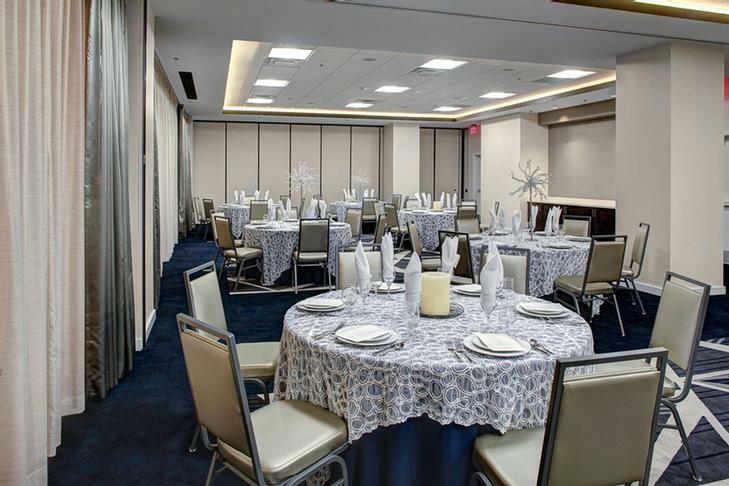 Below are the meeting, banquet, conference and event spaces at Hampton Inn & Suites Richmond Downtown. Feel free to use the Hampton Inn & Suites Richmond Downtown meeting space capacities chart below to help in your event planning. Hotel Planner specializes in Richmond event planning for sleeping rooms and meeting space for corporate events, weddings, parties, conventions, negotiated rates and trade shows. 94 x 30 x 15 Ft.